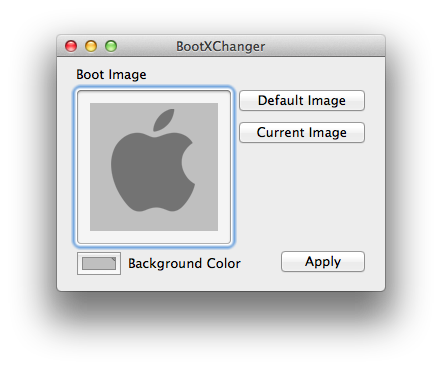 mac and i: BootXChange - customize your boot screen! BootXChange - customize your boot screen! BootXChanger will allow you to change the boot image and background colour on Mac OS X 10.4, 10.5 and 10.6. I had no time to test it on Mac OS X Lion yet (currently on a trip) so use it on your own risk on 10.7. The usage is straight forward and some sample images are included as well. Limitations If your image has transparency, it will be redrawn over the background colour before being applied, so save the original somewhere in case you want to change the background colour later. Some macs will scale big images down when booting, or ignore the image if it's really big. Others will happily accept a full-screen image. If you have a PowerPC Macintosh, you can use BootXChanger 1.0.4, which you can still download from namedfork.net/booxchanger. Discovered it a while back. Green bootscreen, yay! phosports: unnecessary for most, but not all. Some people love to tweak every little thing on their machines. I use to not like mac at all, but it seems like programmers are making things more customizable now-a-days. Keep up the good posts! awesome, i can finally pimp out my sister's mac XD. I love the sound of this app. I hadn't heard of it. Thank you for the post. I installed this app on my new Macbook Air running OS X Lion and it DOESN'T work. Hopefully they update it so that it can work with Lion. I have it installed on my MacBook Pro 17 with Lion and it did work for maybe 20 restarts but then stopped suddenly. I have the same problem on my MacBook Air. I even looked into the system files, and it was replacing the .png image correctly, and yet for some reason it still wasn't having an effect.